Winter Wellness-Self-care tips on how to boost the immune system to prevent colds and flu. Is love healing? You bet. And we’re not talking about just romantic love. A chef, blogger and actress, our guest Karen Geraghty has a life purpose of bringing love to the world. Karen has dual citizenship in the USA and Ireland and currently resides in London. Her blog, Yankee Doodle Paddy is a way to stay connected to all things American and Irish while exploring the deep connection she has to her American motherland and her Irish soul-land. In February Karen hosts the “Month of Love” on the blog, where she invites guests to submit their stories of all sorts of love. (It’s not too late - Karen takes submissions up until the end). Kim, Erik and Karen discuss self-love through health challenges, finding community through Snapchat, Karen’s Woman Crush Wednesday blog feature celebrating women chefs, and her upcoming Woman Crush Wednesday cookbook. Plus, Kim and Erik talk about their submissions to the Month of Love, and we ask the question 'Who would play Erik in a Lifetime movie?' Donate on Karen’s GoFundMe page for the Women Crush Wednesday Cookbook. Proceeds from the sale of the book will go to the Women Chefs and Restaurateurs scholarship program. Try the recipe for "Healthy Breakfast Bars" aka Portable Porridge. Read Kim's stories "Love from the Inside Out" and "Love is a Four-Legged Word," and Erik's story "A Christmas Engagement" on Yankee Doodle Paddy. Find Karen on Snapchat at blissbakery. Spiritual teacher Kristina Luce (aka Anandi) joins Erik and Kim to discuss developing a meditative practice in our fast-paced world. The conversation touches on reconciling science with spirituality, the power of mantras, and of course, meditation. There is some beautiful and powerful sacred singing at 27:40 and 42:20. (If you are driving we recommend you pull over!) Find Kristina at spiritualvoyagers.com, on Facebook, and LinkedIn. Follow her YouTube project, The Human Experiment. We want to know how you use meditation techniques in your life. You can use the Anchor app to leave us an audio message. Or, use your phone’s voice memo app to record a message and email it to us at healingisinyourhands@gmail.com. We’d really love to hear from you, and you may hear yourself on a future episode of Healing is in Your Hands. Healing is in Your Hands is produced by Andrea Muraskin. Music by Craig Norton. Life coach Angela Mendes joins us to talk about vision boards and other ways to counterbalance the human fight-or-flight instinct and manifest our intentions. Erik and Kim also share their experiences with vision boards over the years. (If you’ve ever thought about doing a vision board with your romantic partner, listen to these words of wisdom first!) Angela has a background in education and international communication, and she works with clients all over the world in English and Portuguese. Learn more about Angela at upanji.com, and follow her on Instagram @upanji. Healing is in your hands is produced by Andrea Muraskin. Music for this episode is by Craig Norton. Bone broth - a bone-based soup simmered on low heat for a very long time - plays an important role in Traditional Chinese Medicine, and in hosts Kim Fleck and Erik Harris' healing journeys. Kim and Erik discuss Chinese Medicine theory, sourcing ethically produced and clean foods, selecting herbs, and setting intentions. Kim speaks about her commitment to animal advocacy and her struggle with accepting a necessary meat product into her diet. Plus, a live cooking demonstration and a meditation performed over the soup. To learn more about Erik’s work with herbs and wild foraging, check out episode 3: Fall Forage Walk. Visit Erik’s website, chiforhealing.com to browse his herbal formulas. A Meditative Moment to Hold You Over Wellness Peeps! Erik Harris was immobilized by back injuries and out of work at the age of 23. Kim Fleck became sick at age 34 after moving to CT., lost all of her hair in 2011; a reaction to medications for ulcerative colitis and Crohn’s disease and ended up with a permanent ileostomy. Western medicine kept them alive, but they were far from healthy. Then they each started down a different path. 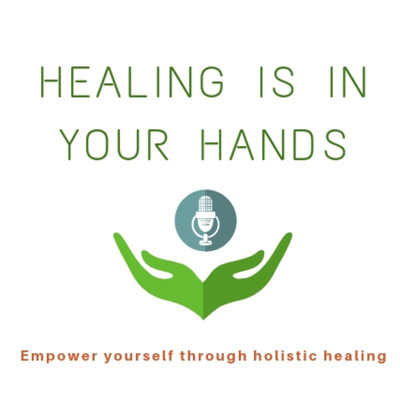 In this first episode of Healing is in Your Hands, co-hosts Kim and Erik share the astounding stories of their journeys to wellness, with a few laughs along the way.